I stamped the background in black and clear-embossed it. I then adhered some fun foam to some Soft Stone cardstock and ran it through the Big Shot with my Eiffel Tower die. I also used the same die with a panel of black cardstock which I offset slight to create a shadow. The sentiment is embossed with Crushed Curry EP. For my next card, which is actually my first card 😃, I used silver metallic embossing paste over a stars stencil on a panel of Slate cardstock. The rest of the card was made the same, except the EP on this card is Buttercup which I then outlined with a gray Copic marker. Thanks for visiting. Take a minute to check out the rest of the design team's cards - they are awesome! These are both so chic! 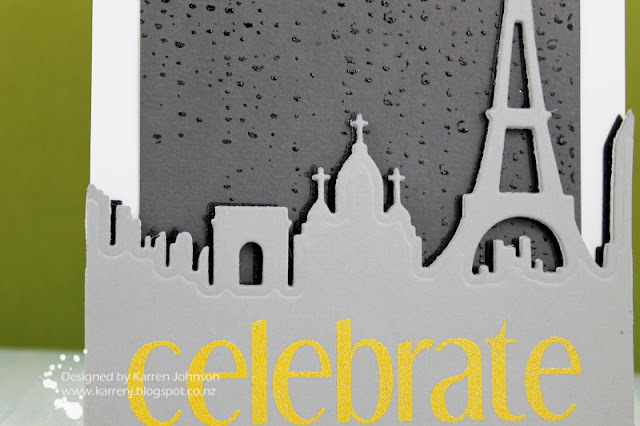 I especially love the texture of the metallic embossing paste! You are so funny! Two for the price of one! And they are both terrific! Love that diecut! The rainy background really caught my eye! I LOVE how pretty, yet so simple and elegant this is! Beautiful! Both are beautiful, Karren, but I really like the raining effect on the first one and the white frame at the top part!!!!! Wonderfully done!!!! Two FABULOUS cards!!!!! super cool take on the inspiration, karren! 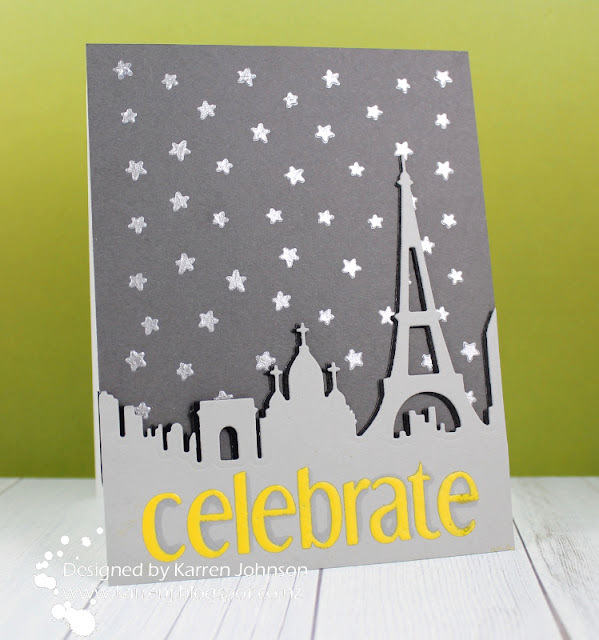 Both cards are absolutely gorgeous, Karren! 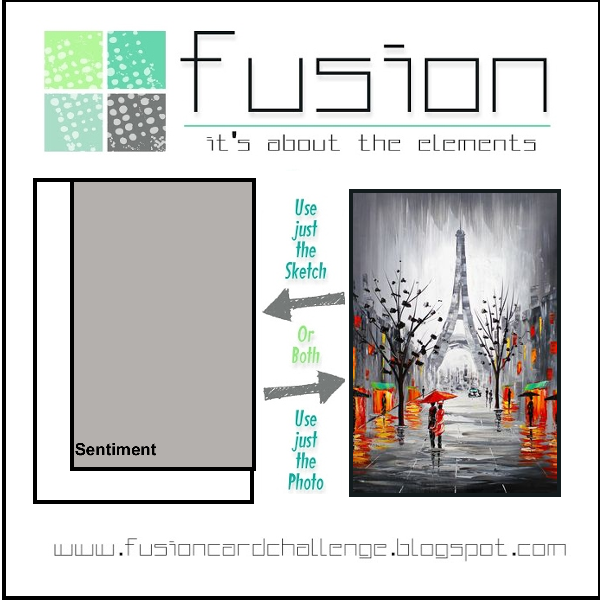 So chic with the different shades of gray, and I love the pop of yellow on your sentiment! 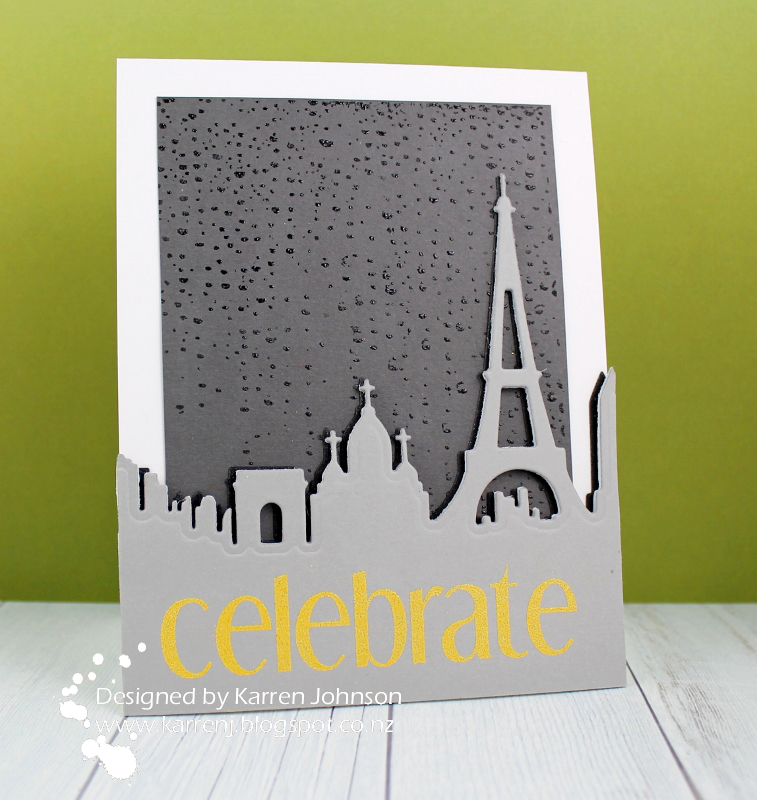 LOVE the effect of your Waterfall background on the first card and the silver stars on the 2nd one...Really fabulous take on the challenge! Wow ... talk about the perfect die for a Paris Rain challenge! Oh so crisp & fabyy!